Start off your visit on the 14th (Wed): tour the pleasant surroundings at Cheyenne Mountain Zoo and then identify plant and animal life at Garden of the Gods. To find maps, ratings, reviews, and tourist information, refer to the Colorado Springs holiday app . Dallas to Colorado Springs is an approximately 4-hour flight. You can also do a combination of flight and shuttle; or drive. Traveling from Dallas to Colorado Springs, you'll gain 1 hour due to the time zone difference. While traveling from Dallas, expect a bit cooler days and cooler nights in Colorado Springs, ranging from highs of 55°F to lows of 27°F. Finish your sightseeing early on the 14th (Wed) so you can drive to Rocky Mountain National Park. 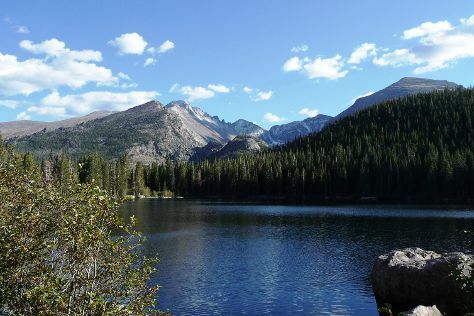 On the 15th (Thu), explore the activities along Bear Lake, then take a memorable drive along Trail Ridge Road, and then take some stellar pictures from Farview Curve Overlook. For ratings, more things to do, photos, and other tourist information, read our Rocky Mountain National Park journey builder website . You can drive from Colorado Springs to Rocky Mountain National Park in 3 hours. Alternatively, you can do a combination of bus and taxi. In November, plan for daily highs up to 57°F, and evening lows to 27°F. Finish your sightseeing early on the 15th (Thu) to allow enough time to drive to Aspen. Start off your visit on the 16th (Fri): take in the awesome beauty at Maroon Bells. Keep things going the next day: tour the pleasant surroundings at Maroon Lake Scenic Trail and then explore and take pictures at Independence Pass. Planning Aspen trip won't be overwheling when you use's Insprock itinerary maker. Traveling by car from Rocky Mountain National Park to Aspen takes 5 hours. Alternatively, you can do a combination of car and bus; or do a combination of car, bus, and flight. In November, Aspen is a bit cooler than Rocky Mountain National Park - with highs of 47°F and lows of 20°F. Finish up your sightseeing early on the 17th (Sat) so you can travel back home.